Different studies have recorded varying levels of utilisation of the components of MHS in different study areas. For example, while Nigeria Demographic Health Survey 2008 reported that 85.1% of the mothers in Osun State, southwestern Nigeria, had their last delivery in a health facility, a local study done in an urban setting of the same state reported 49.1%. , Similarly, the same report gave a figure of 18.4% for mothers in Kaduna State, northwestern Nigeria, while a local study in a peri-urban settlement of the same state reported it to be 27.6%. Such variation in findings across different study areas is an indication that variations also exist in the factors that determine utilisation of the different components of MHS. This, therefore, underscores the need for local studies to generate information that is necessary for planning and implementation of public health programmes in manners that take individual local peculiarities into consideration. In northern Nigeria, studies have been carried out to determine the levels of utilisation of MHS and to identify the factors that influence it. ,,, However, most of these studies appeared to have used only close-ended questions, which usually have a limitation in such studies. Therefore, this study was conducted to determine, from the mothers' perspective, barriers to utilisation of MHS in a semi-urban community in northern Nigeria vis-à-vis the changes that they believe will improve these services. The study was conducted in Giwa, a semi-urban community with a population of 58,875 based on the 2006 census. It is the headquarters of Giwa Local Government Area of Kaduna State, inhabited predominantly by Hausa Muslims. Level of education is generally low among the people of the communities, and the main occupation of the men is farming and trading. Giwa has five primary and four secondary schools. It also has access to mobile telephone network, radio and television reception. The major road from Zaria to Sokoto passes through Giwa town. There is one primary health care centre, four health clinics and a secondary health facility which serves as the referral hospital. As with other local government areas of Kaduna State, MHS is said to be provided free of charge by one of the health facilities. The mothers were selected through a multistage sampling technique. In the first stage, five unguwa were selected from a list of all the eight unguwa in Giwa (unguwa means a neighbourhood with people living within it mostly having similar characteristics). The second stage involved selection of the first street to be visited in each of these five unguwa. For each selected unguwa, a list of all the streets/paths in it was made and, through balloting, one street was selected as the first to be visited. After this, a list of all the houses in the first street/path was made and balloting was used to select the first house to be visited. In the selected house, the eligible household was identified and visited. Where a house contained more than one eligible household, one household was selected for the visit using balloting. Also, where there was more than one eligible mother in a selected household, only one was selected by balloting and interviewed. On completion of the interview in one house (or where there was no eligible household in the house), the interviewer exited that house and moved to the house whose entrance was next to and to the right of the one that was exited. On reaching the end of the street/path, the street/path to the right and the first house to the right were taken next. This process continued until 30 mothers were interviewed in each unguwa, making a total of 150 mothers. All the women who were approached agreed to participate in the study. Data collection was done in the native language (Hausa) over 3 days, and by a team of three community health officers. It was done using a structured interviewer-administered questionnaire that contained open- and close-ended questions, designed by the researchers. The questionnaire had four sections covering respectively: (A) socio-demographic characteristics of respondents, (B) awareness on MHS, (C) utilisation of MHS (this also covered the reasons for non-utilisation) and (D) suggestions to improve MHS. The questions on reasons for non-utilisation and the ones on suggestions to improve MHS were open-ended, while all the others were close-ended. It was pretested in Bomo, a community that was similar to the study area but located in a different local government area (LGA) called Sabon Gari. It was done by the three community health officers who administered it to 15 mothers who met the eligibility criteria used in the study. After the pretest, no significant adjustment was necessary to the questionnaire. The answers to open-ended questions were first grouped into discrete categories that did not overlap, and all data were entered into SPSS statistics 17.0. Frequencies and percentages were then generated for each category, including 95% confidence intervals of the percentages. Chi-square goodness of fit test was applied at P < 0.05 to test whether the differences in the percentages between the categories were statistically significant [Table 1]. Microsoft Office Excel 2007 was used to construct a bar chart. A mother was considered to be aware of a service if she mentioned correctly the basic function of the service. For preconception, ANC and postnatal care services, a mother was taken to have used a service if she had accessed the service at a health facility at least once. In the case of delivery service, she was considered to have used the service if her last delivery was at a health facility. She was considered to have used family planning service if she had ever demanded family planning information and/or commodity in a health facility. A total of 150 mothers aged 15-49 years were studied. Their mean age was 28.9 ± 9.1 years. Nearly half (44.0%) were unemployed and about the same proportion (48.7%) had formal education [Table 2]. Majority of them (128 (85.3%)) were Hausa, while the remaining were Igbo, Yoruba and other ethnic minorities. In addition, majority (131 (87.3%)) were Muslims, while the remaining were all Christians. Most of them (140 (93.4%)) were within 30-min travel time from a health facility. About 62% of them had paid for the MHS received. The proportion that was aware of preconception care was 4.0%, ANC 100.0%, delivery 58.7%, postnatal 46.6% and family planning services 86.0%. 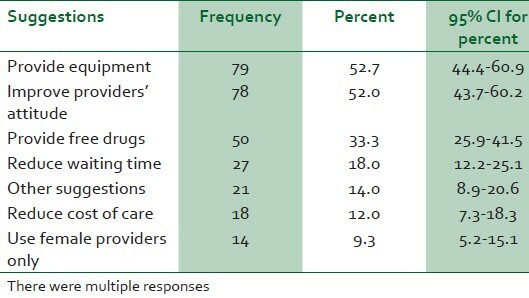 The proportion that utilised preconception care was 2.7%, ANC 98.7%, delivery 24.0%, postnatal care 35.3% and family planning service 14.0% [Figure 1]. Among the 148 (98.7%) respondents who attended ANC, 101 (66.9%) attended four or more times while the remaining did so less than four times. With respect to place of delivery, only 36 (24.0%) delivered in a health facility. As shown in [Table 1], among the 114 who did not deliver in a health facility, 57% (CI = 47.4-66.1) said it was because they had never experienced any delivery complication in the past, 23.7% (CI = 16.4-32.7) mentioned negative attitude of providers and only 6.1% (CI = 2.7-12.7) mentioned high cost. The non-equality between these categories was statistically significant ( P < 0.0001). 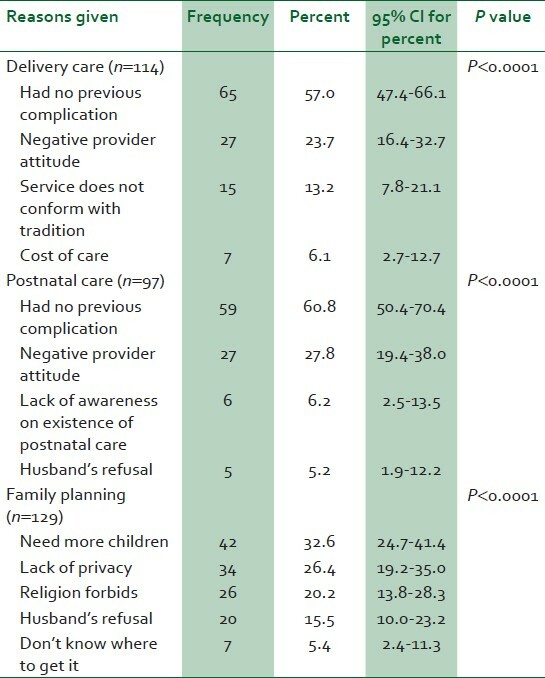 Reasons given for non-utilisation of postnatal care service were as follows: Not having any previous postnatal complication by 60.8% (50.4-70.4), negative provider attitude by 27.8% (CI = 19.4-38.0), while husband's refusal was mentioned by only 5.2% (CI = 1.9-12.2). Similarly, the non-equality between these categories was statistically significant ( P<0.0001). As to the reasons for non-utilisation of family planning, the commonest reason was the desire to have more children (32.6% (24.7-41.4)), followed by lack of privacy in the provision of family planning service (26.4% (CI = 19.2-35.0)), while the least proportion of 5.4% (CI = 2.4-11.3) attributed it to lack of knowledge of where to get the service. These categories also showed non-equality that was statistically significant ( P < 0.0001). Reasons for non-utilisation of preconception care were not computed because only 6 (4.0%) were aware of preconception care in the first place. Similarly, reasons for non-use of ANC were not computed because only 2 (1.3%) were not using ANC. [Table 3] shows the various suggestions by the respondents on areas that required improvement in MHS. The two prominent suggestions were the need to provide equipment (52.7% (44.4-60.7)) and improvement of provider's attitude (52.0% (43.7-60.2)), and the least prominent was the need for providers of MHS to be all females (9.3% (5.2-15.1)). Other suggestions included provision of free drugs, reduction of waiting time and reduction of cost of care. In this study, only a fraction of the women who were aware of MHS were using it. A similar finding has been documented in a previous study. It underscores the fact that other factors apart from awareness contribute to the use of MHS. The fact that the gap between awareness and utilisation is most noticeable with family planning services may be explained by earlier assertions that poor utilisation of family planning in northern Nigerian communities was mainly due to ignorance and suspicion. Moreover, being aware that a service exists does not necessarily imply having good knowledge or understanding of what the service is all about. This is obvious from the reasons mentioned by the respondents in this study. Their need for more children supports the fact that campaigns to improve the use of family planning need to be more informative, paying less attention to the restriction of family size, and encouraging individuals to achieve their desired family size by simply spacing or delaying pregnancies, as affirmed in the World Population Plan of Action. In this study, lack of privacy is a prominent reason for non-utilisation of family planning probably because family planning issues are viewed as private in communities like this, as has been documented by earlier studies. , This observation reiterates the fact that more efforts need to be made to improve the quality of family planning service by observing privacy to an extent and in a manner that takes into consideration the preference of clients on how the service should be deployed. Almost all the women interviewed were not aware of preconception care, which implies that extensive awareness campaign is needed in order to improve its use. In this study, the proportion of women who delivered in a health facility is similar to what was obtained in a previous study in the same area,  even though two other studies have recorded higher figures in the same region. , A possible explanation could be that there is more preponderance of other ethnic minorities in this community compared to the other study areas, as the cultural preference for privacy during delivery is known to be more prevalent among Hausa women. The paradox of high ANC attendance but low health facility delivery seen in this study had been observed in a similar study in the same region. This means that the high ANC attendance in this area did not serve as an opportunity for recruiting the mothers into health facility delivery. An explanation for this could be that quality of the ANC service received was compromised, leading to a situation where the mothers were not getting all necessary information during their ANC visits. This could be the reason why majority of the mothers said the reason for not delivering in a health facility was because they had not experienced a previous complication, not knowing that every pregnancy comes with its own risk, a reason which was also the most commonly mentioned to justify their non-use of postnatal care. Interestingly, cost of care was not prominent among the reasons mentioned by the mothers for their non-use of MHS and among their list of suggestions on how the use of MHS could be improved. This finding contradicts that of previous studies that reported cost of care to be a prominent determinant of use of MHS. ,,, But this is understandable considering that free MHS was said to be provided in the area. This suggests that while there is the need to make MHS affordable to pregnant women, there is a more pressing need to improve its quality. We, however, recognize that this study has a few limitations. The data collected were based on self-report by the mothers and could not be independently verified. Therefore, the possibility of recall bias or willful misstatement exists, so that some of the data collected may not have reflected the true opinions of all the respondents. These limitations were minimised by the use of interviewers who were skilled in qualitative and quantitative data collection, fluent in the local language and whom the members of the community were likely to freely discuss private issues with because they were not members of the same community. In addition, the findings from this study must be interpreted with caution, especially in the case of communities that are not similar to the study community. In conclusion, our study found that the use of MHS among the study subjects was poor. The major reasons that they gave for this were that they had never experienced obstetric complication in the past and the negative attitude of the health care provider, while cost of care was not prominent. Therefore, while there is a need to increase the use of MHS by raising awareness on it, bringing it closer to the mothers and making it more affordable, there is a more pressing need to improve its quality. This could be achieved by building the capacity of the health care providers on modern concepts for delivery of MHS. In addition, further studies are needed to explore ways through which the negative attitude of health care providers could be alleviated. 1. WHO, UNICEF, UNFPA, The World Bank. Trends in maternal mortality: 1990 to 2012. Available from: http://www.unfpa.org/webdav/site/global/shared/documents/publications/2012/Trends_in_maternal_mortality_A4-1.pdf. [Last accessed on 2012 Nov 15]. 2. National Population Commission and ICF Macro. 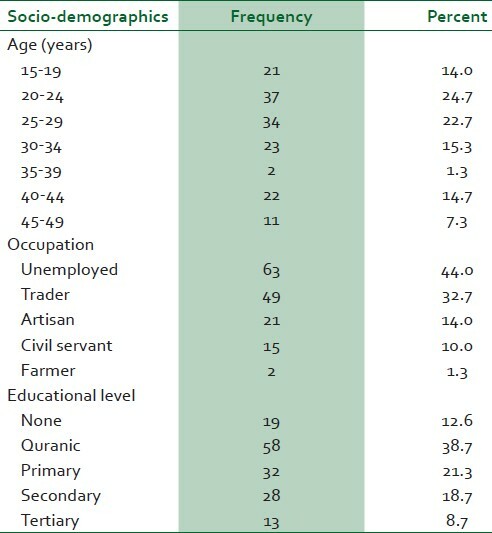 Nigeria Demographic and Health Survey 2008. Abuja, Nigeria: National Population Commission; 2009. p. 126-237. 3. Federal Ministry of Health, United Nations Children′s Fund. Nigeria Multiple Indicator Cluster Survey 1999. Nigeria: National Bureau of Statistics; 2009. 4. Saha S, Kabir M. Factors influencing women receiving safe child-delivery care in Bangladesh. 2006;8. [Online]. Available from: http://www.longwoods.com/publications/world-health-population/530. [Last accessed on 2012 May 25]. 5. De-Brouwere V, Tonglet R, Van LW. Strategies for reducing maternal mortality in developing countries: What can we learn from the history of the industrialized West? Trop Med Int Health 1998;3:771-82. 6. Ekwempu CC. The influence of ANC on pregnancy outcome. Trop J Obstet Gynaecol 1988;1:67-71. 7. Okonofua FE, Abejide A, Makanjuola RA. Maternal mortality in Ile Ife, Nigeria: A study of risk factors. Stud Fam Plann 1992;23:319-24. 8. Dare FO, Bako AU, Ezechi OC. Puerperal sepsis: A preventable post partum complication. Trop Doct 1998;28:92-5. 9. Ezechi OC, Nwokoro CA, Kalu BK, Njokanma OF, Okeke GC. Caesarean morbidity and mortality in a private hospital in Lagos, Nigeria. Trop J Obstet Gynaecol 2002;19:97-100. 10. Onwudiegwu U, Ezechi OC. Emergency obstetric admissions: Late referrals, misdiagnoses and consequences. J Obstet Gynaecol 2001;21:570-5. 11. Ogunlesi TA. The pattern of utilization of prenatal and delivery services in Ilesa, Nigeria. The Internet Journal of Epidemiology 2005;2. [Online]. Available from: http://www.ispub.com/journal/the-internet-journal-of-epidemiology/volume-2-number-2/the-pattern-of-utilization-of-prenatal-and-delivery-services-in-ilesa-nigeria.html. [Last accessed on 2012 May 3]. 12. Idris SH, Gwarzo UM, Shehu AU. Determinants of place of delivery among women in a semi-urban settlement in Zaria, northern Nigeria. Ann Afr Med 2006;5:68-72. 13. Sabitu K, Alti-Mu′azu M, Musa AA, Ifenne DI, Essien ES, Golji NG, et al. The effect of improving maternity services in a secondary facility, Zaria, Nigeria. Int J Gynaecol Obstet 1997;59(S2):S99-106. 14. Adamu YM, Salihu HM. Barriers to the use of antenatal and obstetric care services in rural Kano, Nigeria. J Obstet Gynaecol 2002;22:600-3. 15. Ejembi CL, Alti-Muazu M, Chirdan O, Ezeh HO, Sheidu S. Utilization of maternal health servicess by rural Hausa women in Zaria environs, northern Nigeria: Has primary health care made a difference? J Comm Med Prim Health Care 2004;16:47-54. 16. Duonga DV, Binnsb CW, Leeb AH. Utilization of delivery services at the primary health care level in rural Vietnam. Soc Sci Med 2004;59:2585-95. 17. Higgins JE, Shulman HB. Sample size and power. In: Wingo PA, Higgins JE, Rubin GL, Zahnister SC, editors. An epidemiologic approach to reproductive health. Centre for Disease Control, Atlanta, USA, Family Health International, Research Triangle Park. North Carolina, USA: World Health Organization, Geneva, Switzerland; 1991. p. 157-60. 18. Ibisomi L. Improving contraceptive use in northern Nigeria: Could male involvement make a difference? Proceedings of the 26 th IUSSP International Population Conference, 2009; Marrakech, Morocco. Available from: http://iussp2009.princeton.edu/download.aspx?submissionId=91613). [Last accessed on 2011 Jun 11]. 19. United Nations Population Information Network. World Population Plan of Action. UN Population Division, UN Population Fund. Available from: http://www.un.org/popin/icpd/conference/bkg/wppa.html. [Last accessed on 2012 May 6]. 20. Anand BK, Singh J, Mohi MK. Study of unmet need for family planning in immunisation clinic of a teaching hospital at Patiala, India. The Internet Journal of Health 2010;11. [Online]. Available from: 20. http://www.ispub.com/journal/the-internet-journal-of-health/volume-11-number-1/study-of-unmet-need-for-family-planning-in-immunisation-clinic-of-a-teaching-hospital-at-patiala-india.html. [Last accessed on 2012 May 5]. 21. Ndhlovu L. Quality of care in family planning service delivery in Kenya: Clients′ and providers′ perspectives. Kenya: The Population Council′s Africa OR/TA Project Nairobi; 1995. p. 40-1. 22. Ezechi OC, Fasubaa OB, Obiesie LO, Kalu BK, Loto OM, Dubub VI, et al. Delivery outside hospital after ANC: Prevalence and its predictors. J Obstet Gynaecol 2004;24:745-9. 23. Nigussie M, Mariam DH, Mitike G. Assessment of safe delivery service utilization among women of childbearing age in north Gondar Zone, north-west Ethiopia. Ethiop J Health Dev 2004;18:145-52. 24. Mpembeni RN, Killewo JZ, Leshabari MT, Massawe SN, Jahn A, Mushi D, et al. 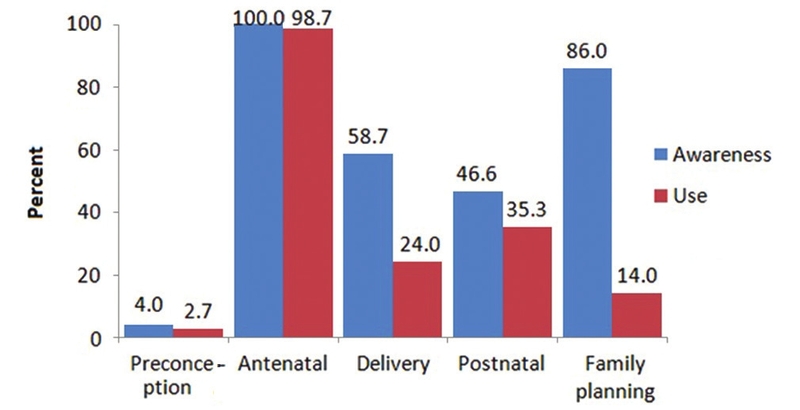 Use pattern of maternal health servicess and determinants of skilled care during delivery in Southern Tanzania: Implications for achievement of MDG-5 targets. BMC Pregnancy Childbirth 2007;7:1-7. 25. Galandanci H, Ejembi C, Iliyasu Z, Alagh B, Umar U. Maternal health in Northern Nigeria-a far cry from ideal. BJOG 2007;114:448-52. 26. Oguntunde O, Aina O, Ibrahim MS, Umar HS, Passano P. Antenatal care and skilled birth attendance in three communities in Kaduna State, Nigeria. Afr J Reprod Health 2010;14:89-96. 27. Couillet M, Serhier Z, Tachfouti N, Elrhazi K, Nejjari C, Perez F. The use of antenatal services in health centres of Fès, Morocco. J Obstet Gynaecol 2007;27:688-94. 28. Uzochukwu BS, Onwujekwe OE, Akpala CO. Did the Bamako Initiative improve the utilization of maternal and child health-care services in Nigeria? A case study of Oji River Local Government Area in Southeast Nigeria. Journal of Health and Population in Developing Countries. 1994. [Online]. Available from: http://www.jhpdc.unc.edu/. [Last cited on 2012 May 24]. 29. Buor D. Distance as a predominant factor in the utilisation of health services in the Kumasi metropolis, Ghana. Geojournal 2002;56:145-57. 30. Kruk ME, Galea S, Prescott M, Freedman LP. Health care financing and utilization of maternal health servicess in developing countries. Health Policy Plan 2007;22:303-10.